What’s Black and White and Orange all over? It’s my Creepy Crawly (but not so scary) Halloween Canvas Art hanging out here At The Picket Fence! 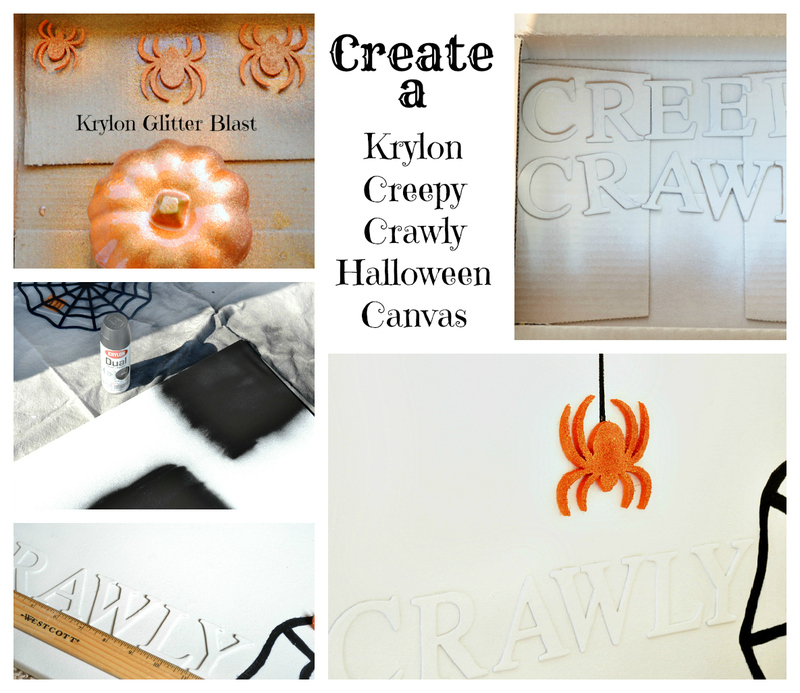 You can make one yourself, it’s super-duper easy using Krylon’s fabulous paints and products! 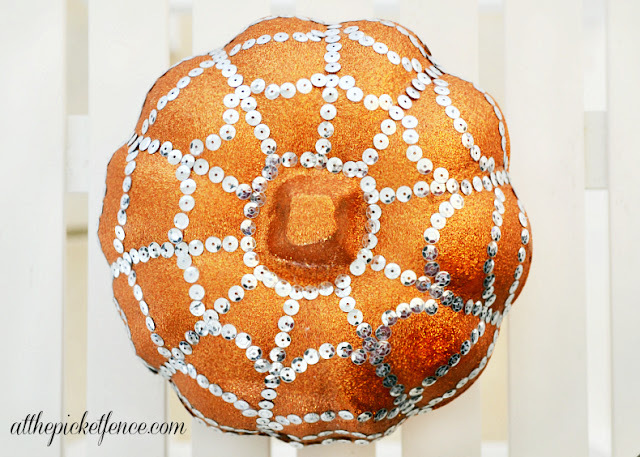 Glitter Blast your spiders in the color of your choice, I chose Orange Glitter Blast, let dry. Using Black Krylon spray paint, mark out the areas you would like for your spider webs, let dry. 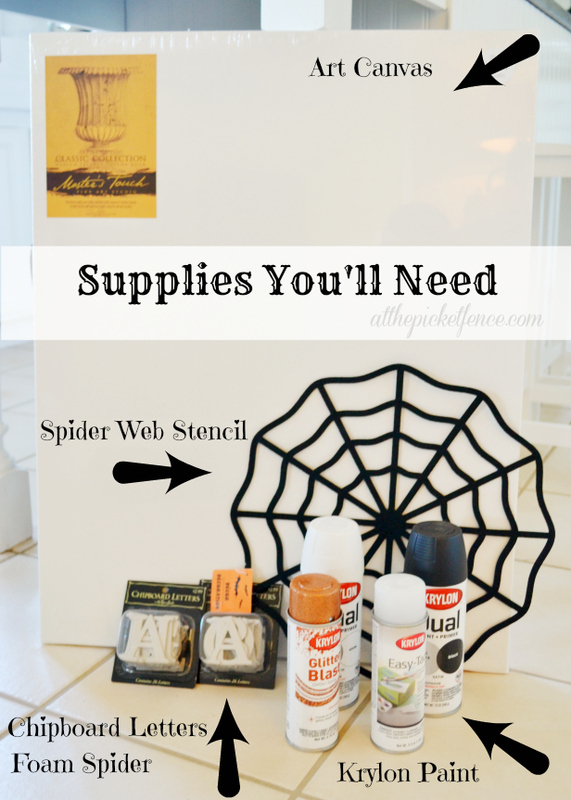 Spray one side of your spider web stencil (I used a spider web cut-out purchased from the Dollar Tree) with Easy Tack Repositionable Adhesive. 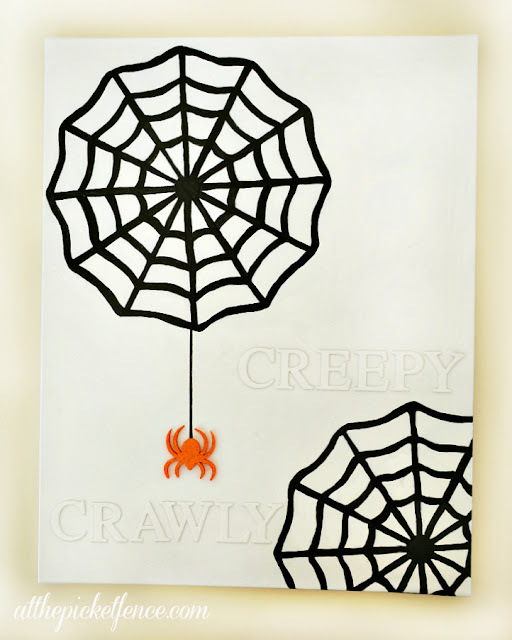 Place spider web over the black paint and coat the entire canvas with White Dual Paint + Primer, let dry. Layout the words Creepy and Crawly with your Chipboard Letters and paint with several light coats of the white paint. Position your letters on canvas using a ruler and glue down. Draw a straight line onto canvas using a paint pen. Glue Spider to canvas. I just love how this Halloween Canvas turned out! My daughter is already trying to claim it for her room. But I think it looks rather cute here in the living room…. 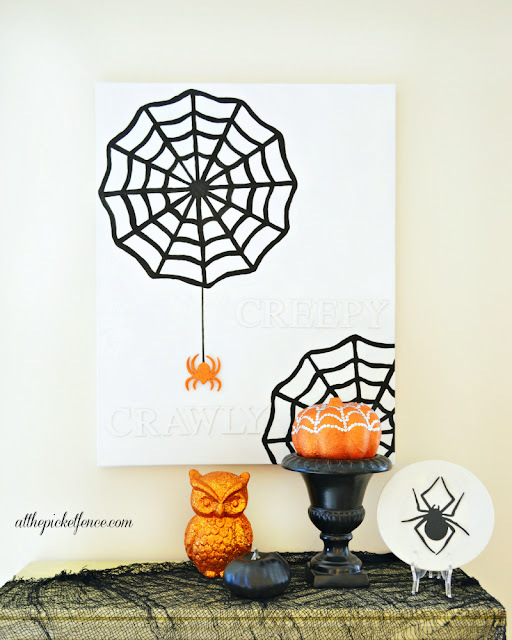 With my Creepy Crawly Halloween Vignette! Next week, I’ll share how to make this fun Glitter Blast Spider Web Bling Pumpkin! Be sure to head over and see what they came up with using fabulous Krylon Products! or be inspired by the fabulous projects in Krylon’s Projects in a Can. Krylon is also having a sweepstakes called “Make it Gr8 in 8” where you can submit a quick fix for a chance to win great prizes. Thanks for creeping and crawling with me here At The Picket Fence! Krylon has provided products and compensation for this post…but all creepiness and crawliness is strictly my own! 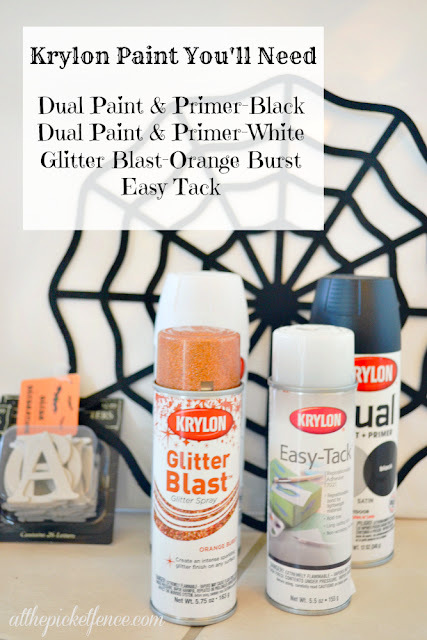 15 Comments on "How To Make a Creepy Crawly Halloween Canvas"
Glitter blast is amazing – I think I may need to get it in every color! 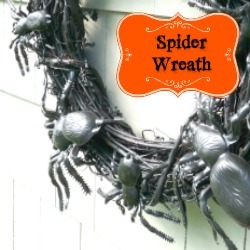 You really know how to spin a web of craftiness! I just saw the glitter blast in the store the other day and was wondering what I could do with it and now I know! Adorable, Heather! I love it! Definitely have the glitter blast sitting on hand. Must give it a try! So SO cute~! I love the Pumpkin and the sweet canvas!!!! Heather, this cute canvas is cute… but even more… it is very upscale!!! I would hang this in my home! LOVE it!!!! Great tutorial… thanks!!!! Great looking project. I love the letters being white. 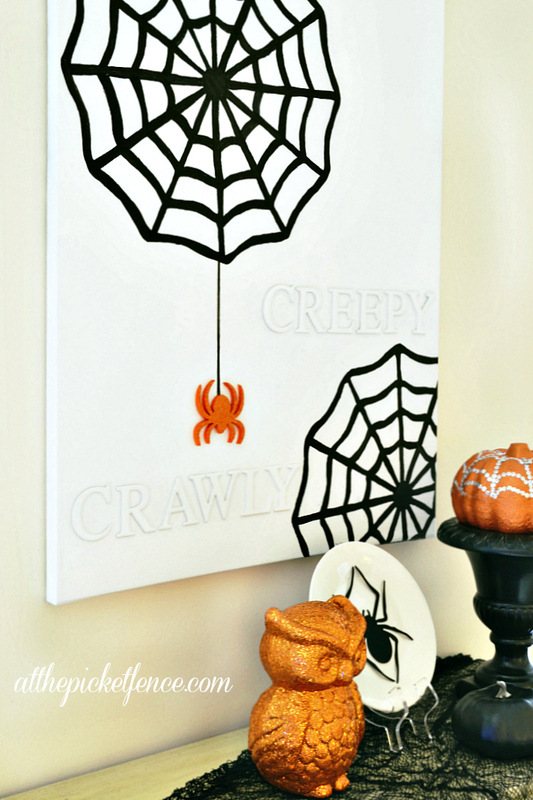 What a fun Halloween decoration…this would be super cute in our playroom. The “creepy crawly” just tops it off! Okay, I’m seriously in love with that glitter spray paint! Seriously! How cool. And your canvas and vignette is the perfect mix of creepy but not at all skin crawly. I mean, who would be afraid of a glitter spider? Hi Heather! Oh, this is so cute! How in the world do you think up these things? I love it and you’re the best! Hi Venessa, I wanted to thank you so much for your sweet kind words to me and they mean so much.